This shop section is named for the Titan goddess of light Theia who was responsible for giving precious stones and metals their intrinsic value. Each piece in this section is fabricated by hand using traditional smithing techniques. 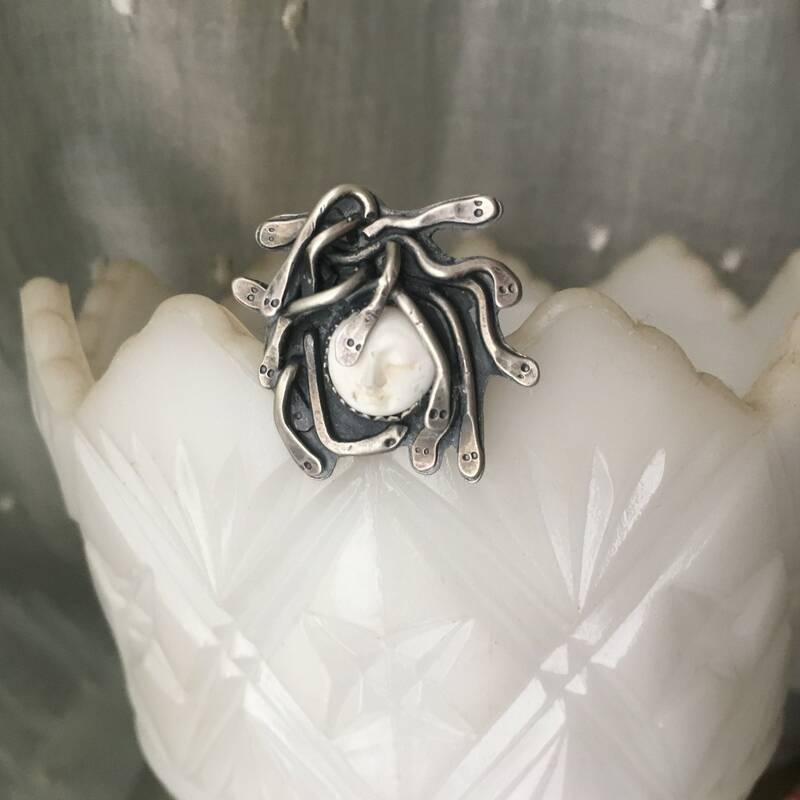 Medusa the gorgon from Greek mythology reproduced from a carved water buffalo bone face and hand fabricated sterling snakes for hair. In some versions on the Medusa myth Medusa is simply the only mortal of the three gorgon sisters, in some (sadder) versions she was originally a beautiful mortal woman turned into the fearsome snake haired gorgon by a vengeful Athena after she is raped by Poseidon. In all versions, her gaze could turn anyone who looked directly at her to stone. She was eventually killed by the hero/ half god Perseus on the quest he was sent on to save his mother from marrying a tyrant king. Her head was delivered to the king Polydectes and from her blood both the beautiful Pegasus and the golden giant Chrysaor were born. The disembodied Head was also useful for turning people to stone, which Perseus used it for on the Titan Atlas, the fiancé of his love, and his mother’s fiancé. It was eventually placed on Athena’s shield. A size 8. 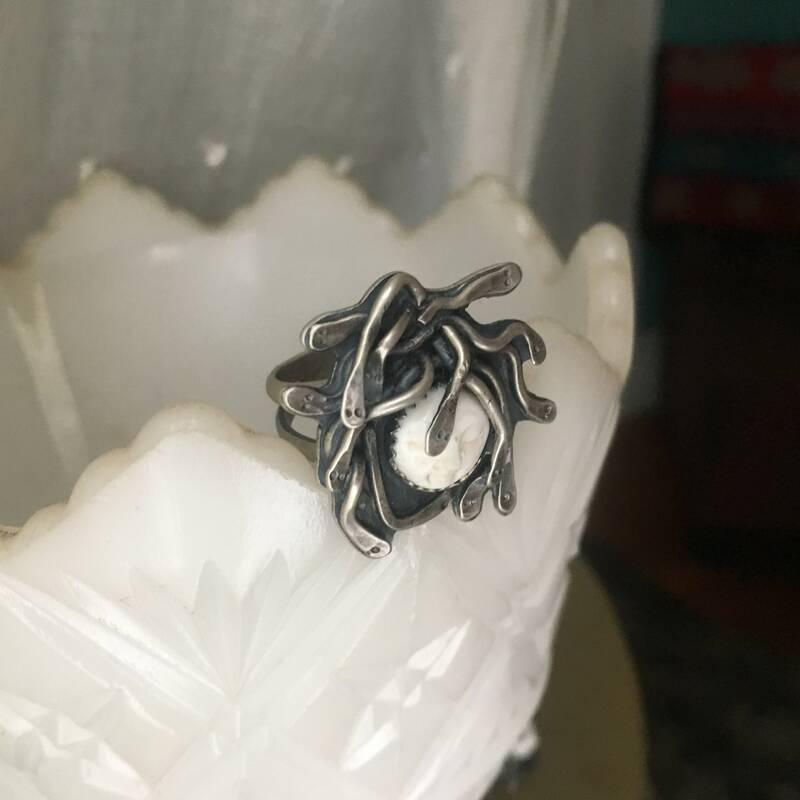 On a split shank band. Could be hammered out up to half a size. On the topic of sourcing and water buffalo bone: this is absolutely NOT from the endangered species of water buffalo. In non-western countries water buffalo are a commonly raised animal for pack and for meat, and live in wild populations, and their bones are a biproduct. They are not raised or killed for this purpose and the tradition of carving their bones into beads and figures is an old one. 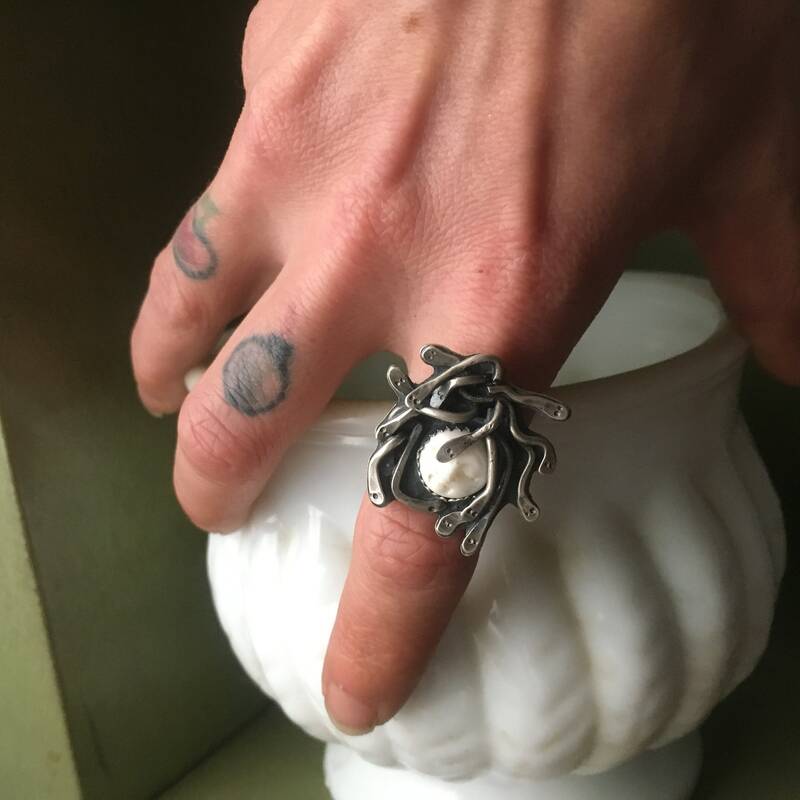 This is a little smaller than the previous Medusa ring. It should still fit snugly so it will stay put because it is heavy. It’s face measures approximately 1 inch in height.